"Hey, guys, look! It's the cross-country team!" I pointed out the window as we drove into our neighborhood. The high school team trains and competes on the running trails that weave throughout our neighborhood. As though they were in the presence of celebrity, my kids craned their necks to get a good view. "Huh," Max noted. "They're all boys." "Well, that's just because this is the Boys Cross-Country Team. There's a Girls' team, too." A moment of silence as we watched the first runners of the group disappear into the woods. "That would be hard for me," Max said. "Running? You're a strong runner." I assured him. "No. Dividing me up like that...If I'm still, you know, like this when I'm in high school." And my heart. It shattered. I clenched my two hands tightly on the wheel. I willed myself to keep my eyes on the road even as they filled with tears. Where have we failed him? Haven't we been so clear and convicted in raising him to express himself fully and completely and confidently? Doesn't he know that he's perfect just the way he is? Doesn't he know that he doesn't have to be "divided up?" Doesn't he know that he doesn't have to fit in one of the two neat little boxes that society has created for kids? Either/or? I pulled into our driveway and put the car in park. The kids happily bounded inside the house, ready to begin the Pokemon game they had been planning during the drive home. Sam was just coming up the driveway, too, so I stopped him and told him what Max had said. "What did you say to him?" Sam asked, his Papa Bear in full effect. "I just told him that no matter 'how' he is, he'll always be Max and we'll always love him just the way he is. That's all I could say before..." and my eyes once again filled and my voice got too shaky to continue. "Should we talk to him about it? Should we say more?" Sam wondered. "I don't know. Yes. I think so. I don't know. I need to take a shower." Because sometimes you just need a good cry in the shower, you know? So I did. I took a shower and cried for Max and for the world and for Evan, who's still not gaining weight, and for me, who has to shoulder this burden of not being able to just fix everything and make life smooth and easy for my kids. And it helped. A little. At least I got to express all of the emotions I've been holding in since...I don't know. It's been awhile. I toweled off and put on warm, fuzzy pajamas. Sam came upstairs and said that the other two kids were outside but that Max was in the kitchen. "It's a good time to talk to him if you want to say more." And I did. And it had to be me. Sam hadn't been in the car with us and I didn't want Max to think that his statement was such a Big Bad Important Thing that we had to double team him. So I sat next to him at the kitchen table where he was sorting his Pokemon cards in his binder. "Baby, I want to talk to you about what you said in the car." He looked up at me, for just the briefest moment, before looking back at his cards. "Yeah?" "Listen. There are lots of different types of people in this world. Some of them feel totally like a boy. Some of them feel totally like a girl. And some of them feel somewhere in the middle...not totally boy or girl. And they're all perfect. There is nothing wrong with any of them. Right now, you feel somewhere in the middle. You may not always feel that way. But you might. 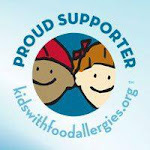 Even when you're a grown-up, you may still feel like you're a little of both. And there's nothing wrong with that. You never have to pick one or the other because, no matter what, you're always going to be our Max. And you're perfect just like you are. You always will be." I showed him an Instagram account of a beauty/make-up columnist that I follow: Tynan Buck. He's a gorgeous guy with short, candy-colored hair, scruffy facial hair, and the most fabulous nails and make-up I've ever seen. Max scrolled through his photos, commenting on which lipstick shades he liked and which metallic nail colors he wanted. "I want you to know, baby, that you never have to be 'Divided Up.' You can be everything all at once. Let's say that when you get to High School, you want to run cross-country. And let's say that they still have two teams: a boys' team and a girls' team. And let's say that you don't feel like you fit in either of those teams. You know what you do?" For the first time since I started talking, he looked up at me again. 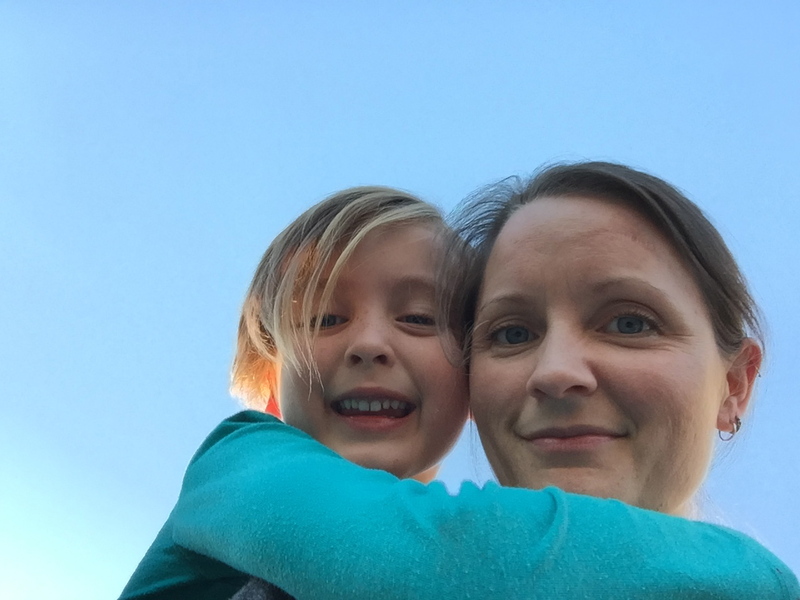 "You join a Running Club that is open to boys and girls." "Really. And if they don't have a boys and girls running club at your school, do you know what you do?" "You start one. And Daddy and I will help you. Don't change who you are to fit in, babe. Change your world to fit you." A smile spread across his face. "So you're saying you want me to be a wrecking ball who crashes down buildings to make more room for my huge palace?" And then he went off on a tangent about Miley Cyrus. The time for our serious conversation, it seemed, had passed. "Yes, baby. That's exactly what I'm saying." I stood up and wrapped my arms around him as he put the last of his cards in their appropriate slots in the pages of his binder. 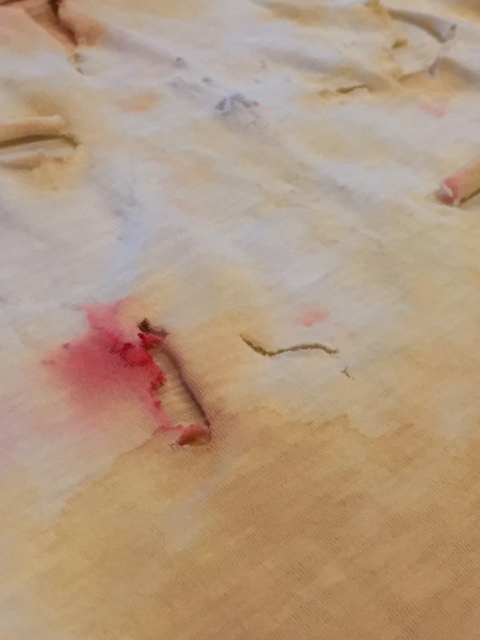 He closed his binder and wriggled out of my hug, eager to join the neighborhood kids playing outside. He looked back at me as he opened the door. "You look like you're going to cry, Mommy." "Happy tears, babe. I just love you so much!" They weren't happy tears. They were the tears of an overwhelmed mama. But he doesn't need to know that. I love Halloween. As far as holidays go, it's up there with my favorites. I love this time of year, I love the decorations, I love the costumes, and I love that it's quick and easy and relatively inexpensive. 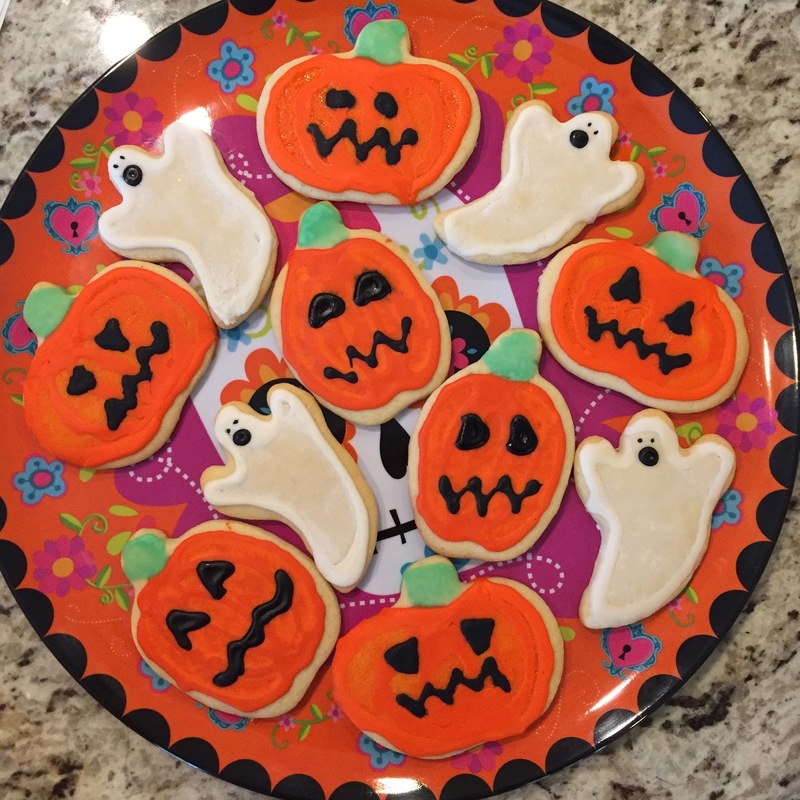 I was thrilled when Max said he wanted a Halloween-themed birthday party this year: I wouldn't have to buy or make a ton of decorations, games and activities would be simple and easy, and I'd get to make my favorite jack-o-lantern and ghostie sugar cookies! Add a little face paint and, presto! Zombie! With just two pieces of poster board (one sheet of black for the witch silhouettes and background shapes and, when I couldn't find purple, a white sheet and a tiny jar of purple glitter paint) and a little yellow construction paper, this was a simple, if slightly labor-intensive game. Those witches took some time to cut out! Despite it's simplicity, Pin the Tail on the Donkey variations end up at nearly all of our parties. For some reason, the kids always love it! Classic Party Game for the win! This game was all Max's idea. I printed out a bunch of little monsters (I laminated them because I think this is a game we'll keep playing even after the party ends!). You'll see on the chart below that there's a number next to each type of monster. That's the number of that type of monster that we stuck to the walls and furniture all over the party space. So, for instance, there were 5 of the purple monster, 3 of the orange monster with horns, 8 of the one-eyed monster, etc. 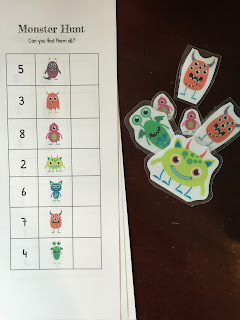 Each kid was given a check list and was sent off on the monster hunt. The goal was to just spot the monsters, not collect them. 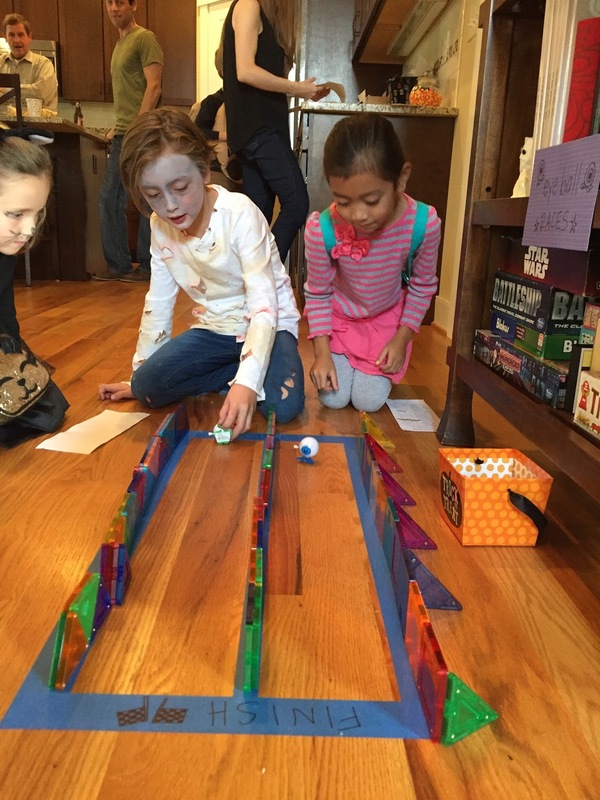 A few of the kids only wanted to find one of each type of monster before returning to the rest of the party activities. Most, however, diligently searched and tallied until all of the monsters had been spotted. I cut a zigzagged opening in an old box and painted it to, more or less, look monster-ish. 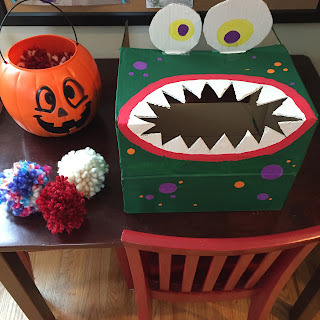 I made a bunch of yarn balls that the kids needed to toss into the monster's mouth. 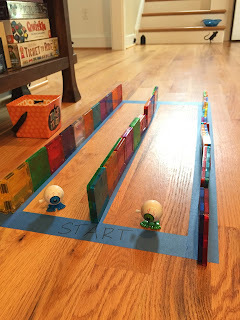 This, again, is one of those classic bean-bag toss games that seem to score big with the kids every time. I've had these laminated paper pumpkins since I was a teacher. I used them in the classroom for various fall activities and have held on to them ever since. 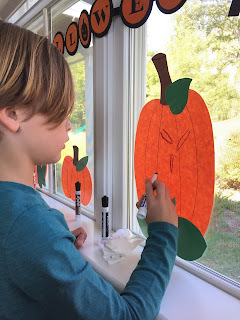 For the party, I taped them on to the windows, placed a dry-erase marker beside each one, and the kids knew exactly what to do. I loved watching them work together to decorate their pumpkins or try to out-silly each other by drawing the funniest Jack-o-Lantern face. This is one of those "just because we have the materials" kind of games. My parents gave the kids a bunch of these little wind-up eyeballs so...of course, we made a racetrack for them. 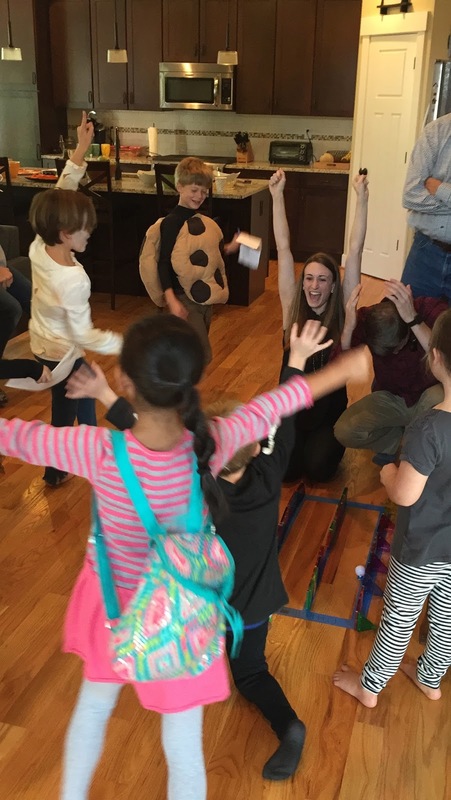 The kids...and grownups!...really got into these races! 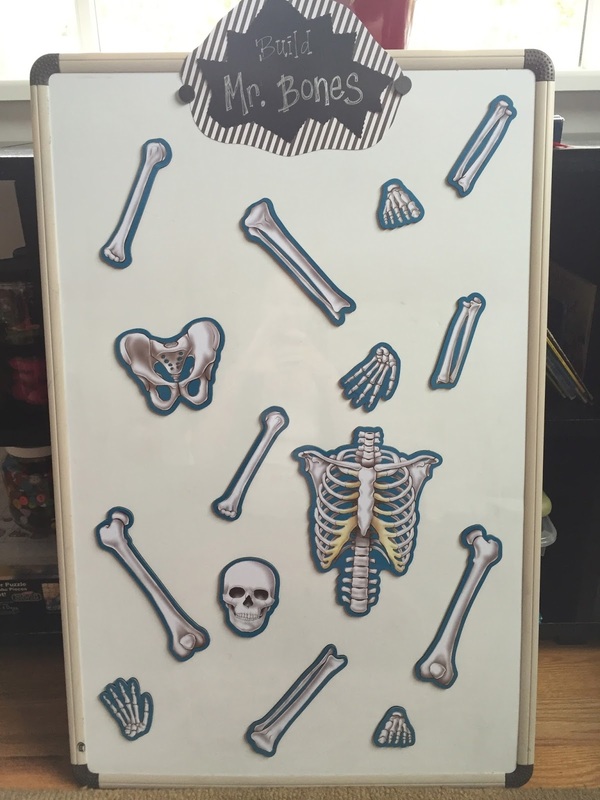 On one side of the front room, a skeleton puzzle. 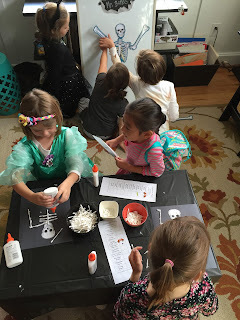 On the other, all the materials needed to make a Q-tip skeleton. 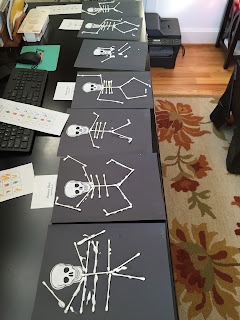 Because the Q-tips were pre-cut to the different sizes (long for the spine, arms, and legs; medium for the ribs; short for the hands and feet) and because I had made an example Q-tip skeleton that the kids could refer to as a guide, the kids were totally independent in this room. I LOVED how they made their skeletons so uniquely their own! Not a single kid followed the guide exactly. As a complete and total arachnophobe, this one pushed me to the edge of my comfort zone. 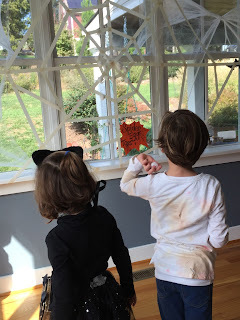 Standing behind a painter's tape line on the floor, the kids tossed cotton ball "spider eggs" toward the web, trying to get their eggs to stick on the web. By the end of the party, the web was covered with spider eggs and I'll have nightmares for weeks. What's a Halloween Party without costumes, right? 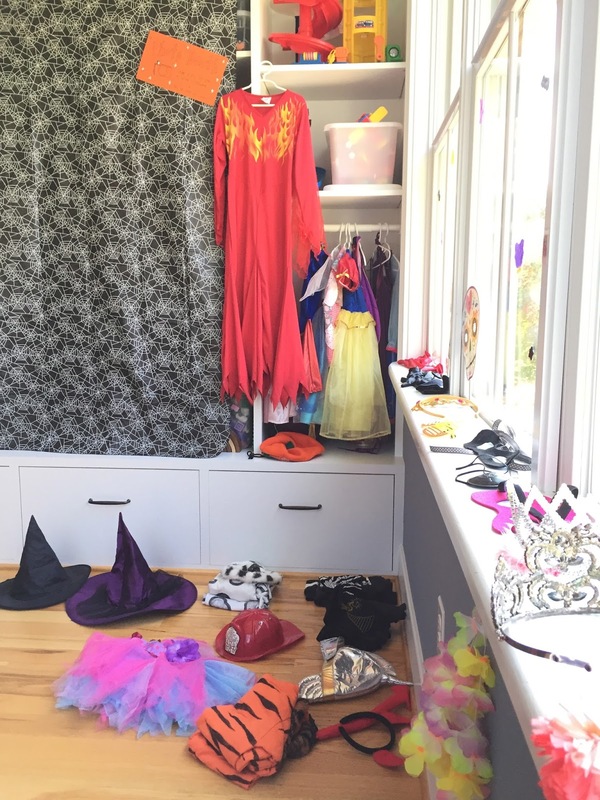 The kids were invited to wear their costume to the party and many did. 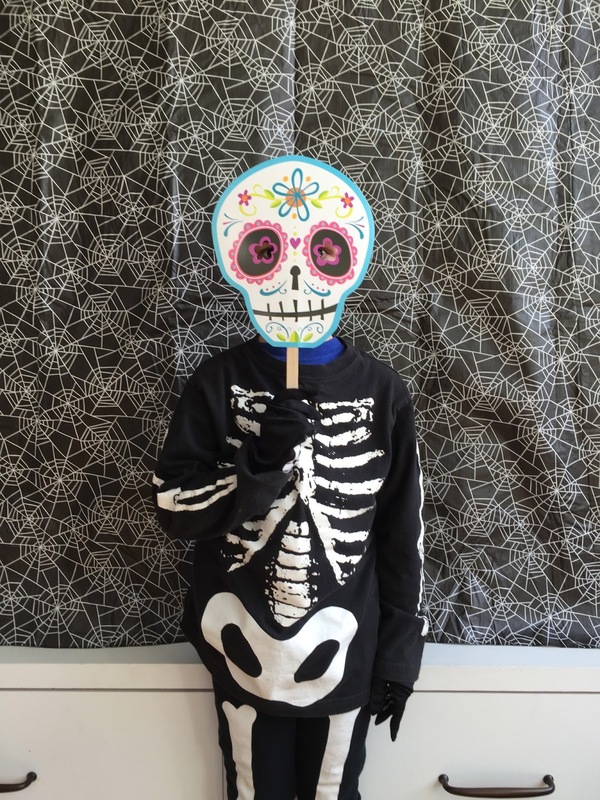 Just about everyone, however, tried on some of our costumes or accessories and had a turn in front of our spiderweb backdrop! I found the cutest little mini pumpkins a few weeks ago at Whole Foods. They were only a dollar each and, with a few stickers and pipe cleaner accessories, they turned into perfect little pumpkin pals that each kid could take home in their goody bag. ...and a Halloween memory game. The best part of any party....the treats! Max wanted sugar cookies and a 7-layer dip. 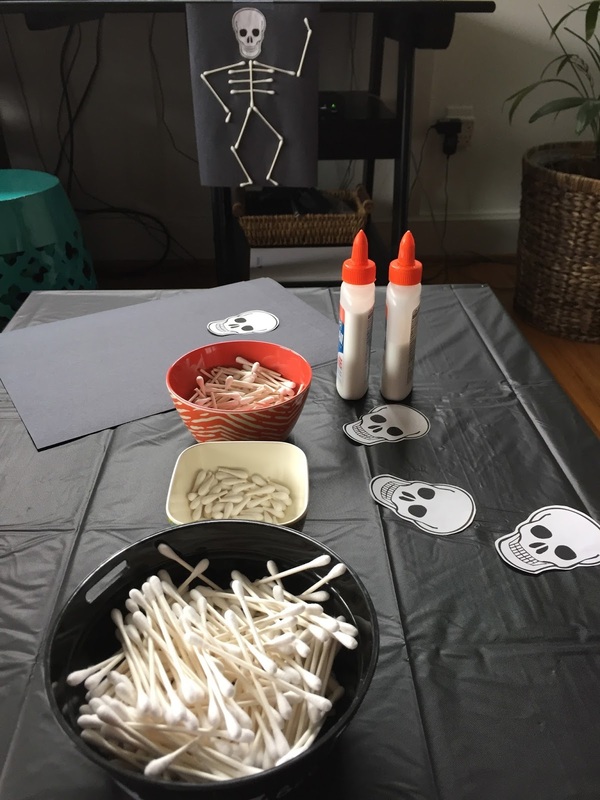 I added popcorn (served in little plastic cauldrons with a few pieces of candy corn) and lemonade (served in adorable little lidded glasses, found in the Target $1 section). It was a great party. And the best part is...I don't have to un-decorate from the party in order to decorate for the upcoming holiday! 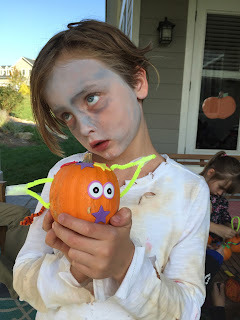 Happy Birthday to the sweetest little zombie you ever did see. OMG, it's finally here! Birthday Day! Max's addition to our calendar, in blue. And OMG. This day could not have come soon enough. This happy, energetic, bouncy, full-of life kiddo has been Driving. Me. Crazy. Anticipation is hard for him. Especially Birthday Anticipation. 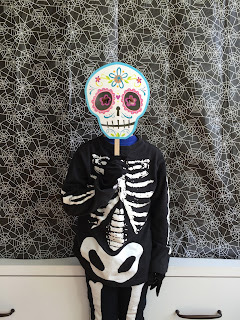 We mark calendars, we count down the days, we make party plans, we decorate, we bake...and every bit of Birthday Prep builds the excitement and energy that becomes all too much to keep inside his already bursting with sparkles body. This last week has been particularly trying. He's bouncing off the walls, climbing the furniture, spinning circles through the house...and the talking Never. Ends. He can't wait to celebrate with his classmates and friends. He can't wait to be able to choose where we eat for his birthday dinner (with no input from big brother thankyouverymuch). He can't wait to see what special presents Sam and I picked out for him ("please say there's Pokemon cards...puh-leeeeeaaase!"). And, as much as he's driving me nuts, I can't help but to be caught up in his excitement because I can't wait to celebrate him--My Max. Seven years old. My creative and imaginative Maker. My sweet and playful Pretender. I love that he knows who he is. I love that he knows what he wants. I love that he comes home from school and has stories upon stories to tell me...a few about what his class is learning or activities he completed, but every detail about his many and varied social interactions of the day: who said what and who sat next to whom...who played with him or who he sat with while he ate his snack... We're tip-toeing into the dreaded waters of "crushes." I reminded him that first graders don't have boyfriends and girlfriends. "Don't worry," he told me. "I can have crushes on ALL of my friends at once." He's a lover, that one. He's an extrovert who thrives on his friendships and time spent with his pals and his brother and sister. I steal him away every once in awhile, though...I love my one-on-one time with Max. I love how he reclines on the couch, ankle crossed over bent knee, listening to music through headphones, bobbing his head to the beat and silently mouthing the words as T. Swift or Jess Glynn belt out his favorite pop songs. I love how he bounds out the back door, headed out to a friend's yard, with a "Love ya, Mama!" I love how he curls up his long legs and arms to still fit onto my lap. I love how he gets so emotionally invested in reality shows like The Voice and The Great British Baking Show that he cries real tears during results episodes. I love how he loves (with cheerful enthusiasm) school. I love how he loves (with patience and understanding) his brother and sister. I love how he turns every hug into a dip...we embrace and then he leans back until I'm forced to play Fred Astaire to his Ginger Rogers. I love how he moves through this world: why walk when you can bounce, dance, or twirl instead? I love how he hams it up for the camera, shining in the spotlight, happy to be the center of attention. My favorite 7-year old in the whole wide world. I can't wait to celebrate you...our 7-year old. Our sweet, gorgeous, big-hearted love. You're one in a million, MaxMan. And I'm so proud that you're mine. Two years ago, I spent the month of October painstakingly hand-stitching individual feathers onto Molly's Baby Owl costume. It was a labor of love: the end result was one of my favorite Halloween costumes of all time. Last year, Molly wore the Baby Tiger costume I had made for Max several years before. 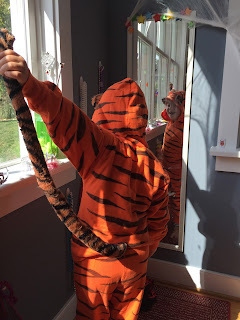 Using a store-bought orange sweat suit, I drew tiger stripes and sewed on a tail and ears. It's tied with the Snow Leopard costume I made the same year for Evan as my second favorite costume of all time. 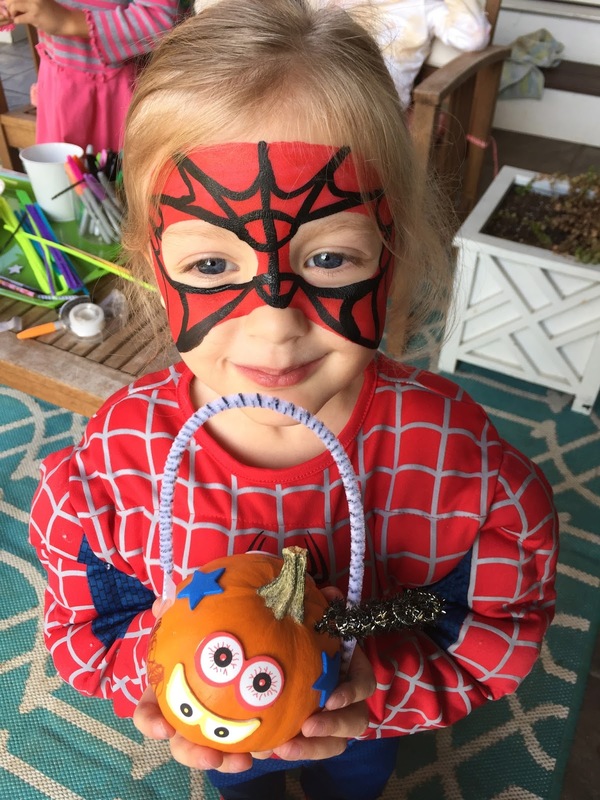 This year, Molly said she wanted to be Spider-Man. When Molly said she wanted to be Spider-Man for Halloween, I said, "Great! So you'll wear your cape and mask from the party. 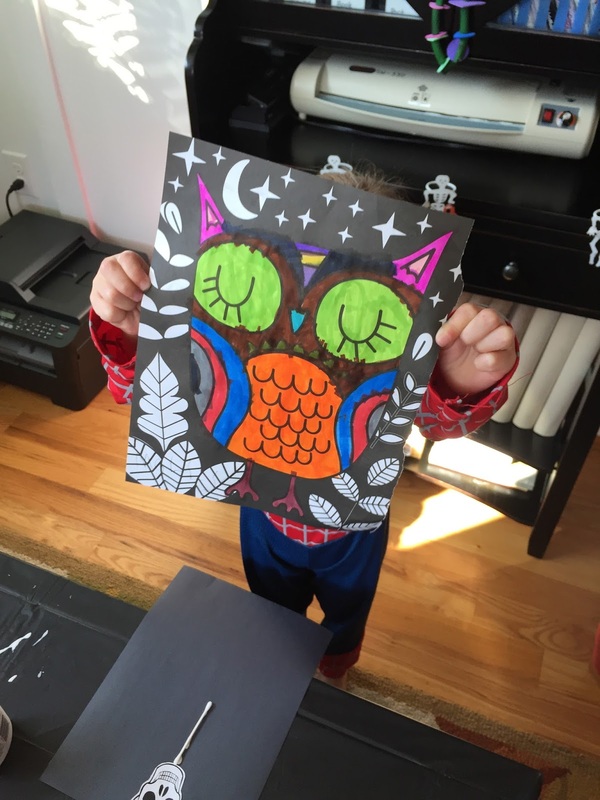 Do you want me to paint a spider or a web onto a t-shirt for you to wear under the cape?" She looked at me with a furrowed brow. "I said I want to be Spider-Man." "Right! You can wear the cape and I'll make your Spidey suit!" "Mommy. My cape is Spider-Girl. Not Spider-Man. Spider-Man doesn't wear a cape." "Besides, Mommy. The real Spider-Man has muscles." We looked online and found a couple of great ones...for $30. I did find an adorable set of Spidey jammies for $12, which she would definitely get more wear out of than a $30 costume, but...no muscles. As a Do-It-Yourself-er, I don't usually ask for help. If there's a job to be done or something to be found or planned or made, I typically just do it. (It's the control freak in me.) For some reason, though, on this afternoon of Halloween costume planning, something urged me to Just Ask. So I did. 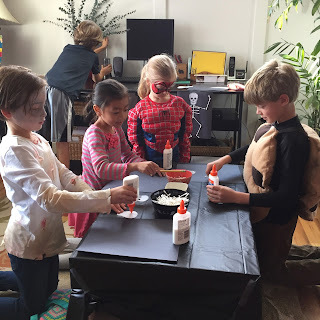 I posted an ISO on my Facebook page: "Does anyone have a 5T(ish) Spider-Man costume lying around? We'd love to borrow or buy." Almost instantly, I received several notifications of "We may! I'll check!" but I didn't have high hopes. 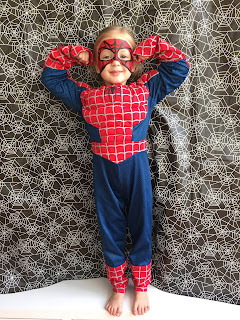 I added a $30 Spider-Man costume (with muscles!) to my amazon smile cart and figured I'd give it a few days before finalizing the purchase. The next day, less than 24 hours after asking for it, a mint-condition, freshly-laundered, Spider-Man costume (with muscles!) showed up on my front porch...courtesy of some of the sweetest boys from one of the nicest families we know. They wouldn't accept our offer to purchase it from them: the boys, my friend said, were happy to give it a new home (and she was happy to get it out of hers!). As for Molly, well, she put it right on and didn't take it off for the next two and a half days. 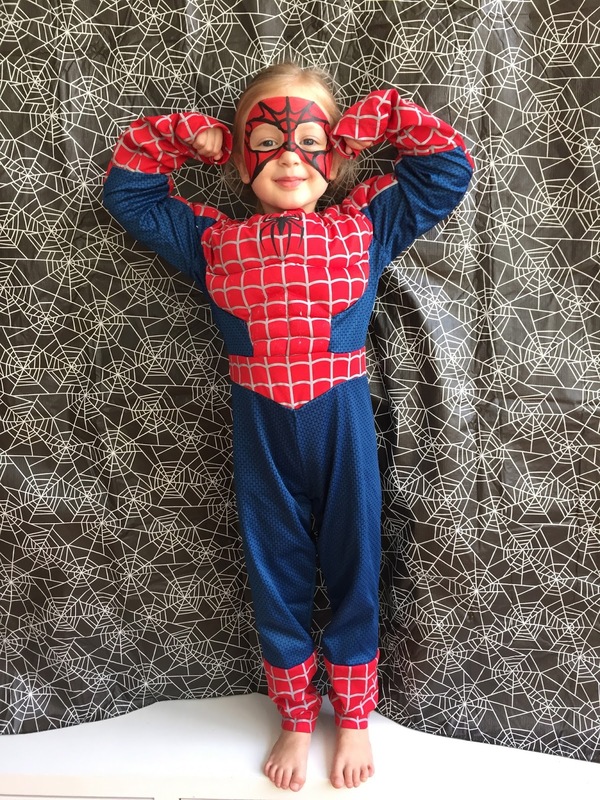 It turns out we would have gotten our money's worth if we had purchased a $30 Spider-Man costume. It also turns out that it doesn't hurt to ask.